I was up bright and early Wednesday morning for my annual volunteer shift at the RWA registration desk. I've been doing this for six conferences and it's one of the highlights of my week. It's a great place to meet and greet people arriving for the conference, connect with old friends and meet new ones. The RWA conference is huge and volunteers are essential to the smooth operation of events. To show their gratitude, RWA randomly chooses one volunteer each day to receive a free registration for the next year's conference. That's a thank-you valued at more than $450! Following my volunteer gig, I headed upstairs for coffee and pastries, hosted by historical romance author, Sabrina Jeffries. It was great catching up with fellow readers/street team members that I met last time RWA was in NYC and meeting new ones. I always enjoy visiting with people who share my love of a particular author's work. I didn't drink much coffee or eat any pastries but I enjoyed laughter in abundance! For those of you unfamiliar with Ellen's, it's a 1950's themed diner that features singing waiters and waitresses. Many future stars of stage and screen spend their early years in the business singing for diners at Ellen's. Fun, fun, fun! The RWA Literacy Signing is a romance reader's version of Disneyland. Picture 400+ romance authors and more than double that number of romance readers, quivering with excitement, all in one room, and you have the biggest RWA national conference event open to the public. All proceeds from sales of books at the signing benefit literacy organizations. This year, the total raised was more than $48,000! Here are a few highlights from the RWA15 Literacy Autographing. Kim of SOS Aloha, one of the many volunteers who keep the signing running smoothly. Elizabeth Michels sparkled and so do her books! A RITA finalist for her romantic suspense novel written as Mary Burton, she also writes women's fiction under the name of Mary Ellen Taylor. I enjoy both! If you're a fan of Downton Abbey, check out these books by Sherri Browning! The awesome Carly Phillips and Janelle Dennison! I really enjoyed Back to Before by Tracy Solheim. Double RITA finalist, Jill Shalvis. I fell in love with her new book, Second Chance Summer. Julia Quinn. I have a keeper shelf dedicated just to her. Love Anna Sugden's hockey heroes...and the Cadbury chocolate she brought me from England! Look at all those RITA pins on Vicki Lewis Thompson's badge! Beautiful, gracious and an amazingly talented author. Nalini Singh has it all. The lovely Roxanne St. Claire. I love visiting her fictional Barefoot Bay. Every conference, there's that one person that you keep running into. This year, Rocki was that person for me. The awesome Sarah MacLean. She's earning her own keeper shelf in my home library. Can't wait to see what she brings us next! One of the loveliest people around. I just adore Sophia Nash. Marni Bates is an awesome YA author and an absolute joy to be around. Let Lily Everett take you Home for Christmas on October 6, 2015. RITA finalist, Kimberly Kincaid also rocked some amazing shoes. Shoe photos to come! Have you read Sally Kilpatrick's debut, The Happy Hour Choir? I so enjoyed it! Double RITA finalist, Patience Griffin. I was so happy to see her debut book, To Scotland With Love recognized in two RITA categories. It's superb! RITA finalist, Meredith Duran (she won!). I was thrilled to see her incredible writing finally recognized with a RITA award. RITA finalist, Carolyn Crane. I found her most recent book, Behind the Mask, riveting. Shana Galen sure knows how to rock those fascinators...and write terrific books! RITA finalist, Tracy Brogan's books are humorous, heartwarming and oodles of fun! Who doesn't love Susan Elizabeth Phillips? Nobody I know! Another author with a badge full of well-deserved RITA pins: the wonderful Lorraine Heath! Have you picked up Julie James' newest book, Suddenly One Summer yet? It's terrific! In my opinion, Rose Lerner is one of the best historical romance writers around. Check out Janga's recent review of Lerner's reissued debut novel, In For A Penny. Yep, that's me with Jude Deveraux. Giddy, fan-girl moment for sure! That's it for the tour of this year's Literacy Autographing. Be sure to stop by tomorrow for more authors, books and fun from RWA15 in New York City! Have you ever been to a multi-author book signing? Which authors would be on your short list? Two randomly selected people who leave a comment will receive a signed book from my conference stash. I've never been to a signing. :) But I'll be in New York for the next conference. Thank you so much for sharing with all your pictures . It's easy to see you had a wonder time. And Jude Devereaux, I love her and can never get enough of her books. I really hope you can make it to the next NYC conference, Carol. You'l love it! Love to see your pics, PJ, glad to see so many awesome authors in one place. Sadly, I've never been to a signing but I would love to go one. My short list would turn into a very long list very easily, but at the top of my list are these authors I'd love to meet (in no particular order since I'm such a fangirl for all their books!) Julia Quinn, Julie James, Jill Shalvis, Julie Anne Long and Nora Roberts. Great list, Anita! I hope you have the opportunity to meet some of them one of these days. My local library has an annual reading festival where several well-known authors attend but only give lectures. However, some local authors are available for attendees to meet and purchase their books. I see so many authors in your pictures that I would love to meet. I feel as though I know Shana Galen very well as she and I chat online all the time. I love her stories about her adorable little girl, Princess Galen. I have read Sherri Browning's books and love them! I have been lucky enough to receive an ARC of her latest book, "The Great Estate" which publishes August 4, 2015. I plan to settle into my favorite chair today and "gobble" it up! Sherri has a fabulous sense of humor and if you're a follower of her, you will howl over her little stories of her funny Dad. Elizabeth Michels is such a cutie-pie and I have just discovered her novels. I cannot wait to read more of them. Shana is lovely in person, Connie. Like you, I also enjoy the Princess Galen stories. She's a charmer! Sherri's online sense of humor is just as lively in person. Glad to hear you're enjoying her books. Elizabeth is exactly as you would imagine from her photos and posts. Glad to hear you're enjoying her books! I was at RT in 2013 and I just went to RAGT this year. These events are lots of fun and exhausting! I'd love to meet Eloisa James. She wasn't there the year I was at RT. I did get to meet Elizabeth Hoyt and Colleen Gleason, who are now two of my favorite authors. I know I met lots of others, but it all goes by in such a whirl. I'm going to the Historical Romance Retreat in Spokane in 2016, so hopefully I can take more time to meet just the historical authors. One of these years I'm determined to make it to both RT and RAGT. I always seem to have a family conflict on those weekends. I hope you get to meet Eloisa one of these days. You'll love her! I'm seriously considering the HRR in Spokane. It looks like it's going to be awesome! Great recap ... and cute photo of me! I'm glad we lunched on Tuesday as the conference get crazy! Still, I saw you many times ... your smile always brightens the moment! Thanks, Kim! Your smile brightens many a room too! Very glad we took the time to lunch on Tuesday! Love all the pictures, PJ. There were a few people I ran into over and over and then there were a few I never got a chance to see at all. :( Loved Julie James latest. I just had to get another (signed) copy for my keeper shelf-- I'll donate the one I bought from Amazon. Great to see you!! I'm so glad we had a chance to chat, Annie! The configuration of the Marriott Times Square is horrible for running into people. There were many people I had hoped to see that I never did. Next time! I've been to the Chicago Spring Fling twice, RT when it was held in Chicago, Barbara Vey's and Lori Foster's Readers Appreciation weekend. I'd like to attend Spring Fling one of these years. I grew up in southwest Michigan and have lots of family up there so I could easily combine the two into one trip. They have a terrific lineup of authors coming in 2016. Love the photos...looks like you had a fantastic time! I have not been to a book conference/signing even though I live in Dallas and RT was just here. It it always the same week as my daughters dance recital as well as my anniversary. So I was so excited to hear it was moved up to April next year and have already warned my family I plan on going to Vegas. Jill Shalvis blog makes me laugh every day so I think she would be defiantly be on my short list! Jill is so funny. Put her together with Kristan Higgins and you'll be laughing uproariously! I was at a multi author signing several years ago. If I were to attend another, authors on my short list would be: Patricia Briggs, Rachel Caine, Meljean Brooks, CL Wilson, Tessa Dare, Joey W. Hill. I haven't read Patricia Briggs. I'll have to check her out. PJ I love Patricia Briggs books -- try them! I have never been to a multi-author signing, and I wonder how I would ever choose which authors to put on my short list. I have so many favorites that I would like to meet. I guess my short list would be Kristan Higgins, Jill Shalvis, Julia Quinn, Julie Ann Long, and Nora Roberts. And now I am thinking of more that I could add to the list. Maybe I could do a version of speed dating and visit them all! Maybe I could do a version of speed dating and visit them all! Those are some pretty terrific authors you've already met, patoct! Have to say I got to visit the dinner about 5 years ago and really enjoyed it! I've never been able to make it to a signing (transportation issues) but would love to. I don't know if I have a short list lol - okay, let's go with Grace Burrowes, Sue-Ellen Welfonder, Jill Shalvis and Karen Ranney to name just a few. That's a great short list, catslady. I haven't yet met Sue-Ellen Welfonder or Karen Ranney but I'd like to. I love their books! *LOL* I love all the giddy fan girl moments with Jude Deveraux. I knew I wouldn't be the only one, but it's fun to see friends of mine also having the same giddy reaction...and having the same "OMG! I'M HAVING MY PICTURE TAKEN WITH JUDE DEVERAUX!" grins. *LOL* I love all the giddy fan girl moments with Jude Deveraux. I know! Isn't it awesome? Even a well-known, NYT Bestselling author was giddy about having her photo taken with her. Never been to a multi-author signing. One of these days, jcp! I have never attended a multi-author signing. Looks wonderful. Great photos. Meeting Jude Deveraux and Grace Burrowes. Grace Burrowes is so nice and down to earth. I think you'd really enjoy meeting her. It would be very special to attend although I haven't as yet. All of my favorite authors, SEP, and Nora Roberts. SEP is wonderful! Nora had a line that stretched halfway around the room yet she never stopped smiling and posing for photos with readers. I have never attended a multi-author book signing, but it looks like fun. Love looking at your pictures. It would be hard to come up with a short list of authors I enjoy, but a few would be SEP, Eloisa James, Julia Quinn, and Julie James. Having only started in 2014 with reading romance novels, I still feel like a giant newbie. I've read two of Rocki St. Clair series, all of Tracy Brogan's but then discovered Historical Romance and read through most of Meredith Duran's books (so happy to see "Fool Me Twice" having won! ), all of Courtney Milan's and discovered Rose Lerner's this year (True Pretenses for the RITA next year!). As a lucky New Yorker by choice, it was a no-brainer to visit the literacy autographing and I met all the herein mentioned writers (with exception of TB) and could not believe my luck! Oh - I also chatted for quite a while with Catherine Bybee whose books (most of them) I read too! I'm so glad you were able to come to the signing! Hope you'll have the chance to meet Tracy Brogan next time. She's delightful! I'm with you in hoping Rose Lerner's book is recognized. She's superbly talented! Just this moment, I came back to your cite, because I felt like the biggest dork throwing all the names out here, AND misspelling Eloisa James :-o - I was totally in awe though to meet Courtney Milan whom I really, really wanted to meet and Meredith Duran and Rose Lerner... I mean, people often talk about "like a kid in a candy store" but this was light years better! Each one of these women were gracious and absolutely wonderful! <3 An experience that will be forever in my heart. I have never been to a signing but would love it. Hopefully, one of these days, Quilt Lady! No I haven't but going to Boonsboro, MD, staying at the Inn & going to a signing with Nora Roberts/JD Robb is on my bucket list. I'd also love to meet Mary Balogh and Rhys Bowen. Hi PJ! I was there last week! Squee! The first authors I saw were Laura Florand, Samantha Grace and Erin Knightley, since I have read all of their books & we are FB friends. This event was so exciting for me & I had to cut myself off from getting more books at one point, because I had to pay the mortgage. lol. 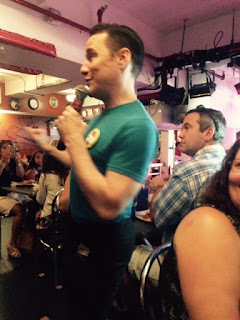 My daughter & I went to Ellen's Stardust Diner for lunch, too! I saw your facebook post about being there. Wish I could have met you! Next time it is in NY, for sure! I was only there for the book signing. I would love to go to one in another state if $ allowed! ooooh... I think my head would explode being so close to all of the authors I enjoy :) I think that I would love to meet Jill Shalvis and Nora Roberts. Thanks for the fun post! Nora had a constant huge line & I got Jill's last book! I go to Spring Fling when they have it and different signings here ... I would love to meet Danielle Steel and Brenda Novak if I could. It was great to see you, PJ! It was so much fun seeing all my favorite authors last week. I was disappointed that Lisa Kleypas wasn't at the signing - she's still on my list of authors to meet. Another author I'd like to meet, even though he's not romance, is Stephen King. Many years ago, a few Harlequin authors made an appearance at a local Walden Books store. That's the only time I've gotten an autograph from a romance author. I've never been but I would LOVE to!